Below is a schematic diagram to show the connections that need to be made to adapt a Koso DL-03SR aftermarket speedometer to the K-bike. I am assuming that the installation will use one of my TGPI boards to get the Neutral / Start Enable / speed functions. Doesn't this "Magic box" do cool things for Speedos? RBM, I'm trying to dial in my Acewell 2853 speedo before my first ride, by taking out the guess work with the TGPI. I dug and dug and dug and found an obscure post somewhere where you personally mention that the stock K100 speed sensor has 6 pulses per tire revolution. My question is, would you suggest setting the acewell circumference to 2090.4mm with pulse per rev of "P001". Or, would you set it to 2090.4mm ÷ 6pulses = 348.4mm and set the pulse per tire revolution to, "p006"? I can comment on my Motogadget and I have to assume that the information can be carried over to the Acewell (but not sure). Short answer: neither is right. At the moment, I'm using the manufacturer supplied inductive pickup mounted on the front forks. I provisioned the left disc rotor with six magnetic bolts. I set the Motogadget to indicate 6 pulses per revolution (equivalent to your p006 setting) and set the tire size variable to be what I measured using a tape measure. For my front tire is a 110/80ZR-18 and the circumference became 1989cm. This put me in the ballpark for speed. I used a GPS app on my mobile phone and strapped that to the handlebars. Then I went riding as various speeds, attempting to compare the GPS indicated speed with the Motogadget indicated speed. I adjusted the circumference number until the two matched. Yes, it does. It does everything that my TGPI card can do plus more, like interface to the 1985 fuel sender and bring out all the 24 signals on the OEM instrument connector to a set of terminal blocks. Makes modifying the K100 plug-n-play. rbm - have you got any boards for only the speed amp available? Yes, I have boards populated with components that only provides the speed sensor shaping circuitry. It is significantly cheaper than a full board. I'm asking $21.00 plus shipping for such a board. I don't use my own circuits because I'm essentially a lazy a$$. I built my bike before I had designed and built the current generation of TGPI boards and I haven't yet found the energy to retrofit one of them on the bike. It is in my TODO list though. If you read my blog, you'll also note that I have a much more complex on-board computer installed than the TGPI board. I also intend to upgrade that device one day. Thank you, Robert. I'll start there. Thank you for taking the time as always for technical support. I highly recommend this board. Very concise instructions and support!
. . . and I haven't yet found the energy to retrofit one of them on the bike. Try a spinach smoothie sweetened with agave syrup. If it has been blessed by a tribal elder, so much the better. Your mod is still kick'n "A". It's great to have more than one option for a 20 year old bike and great people are still using their expertise to contribute. I offered maple cappuccino the other day ... no interest. I'll take one of them there fancy speedometer boards! I am wiring in a Munit and the Motoscope Pro from Motogadget. Might as well get all my wiring pain out of the way now. I'll take one of them there fancy speedometer boards! To which device are you refering—Robert's board or the Marulab device? He sent me a PM so he means my board Laitch. I replied to the PM. 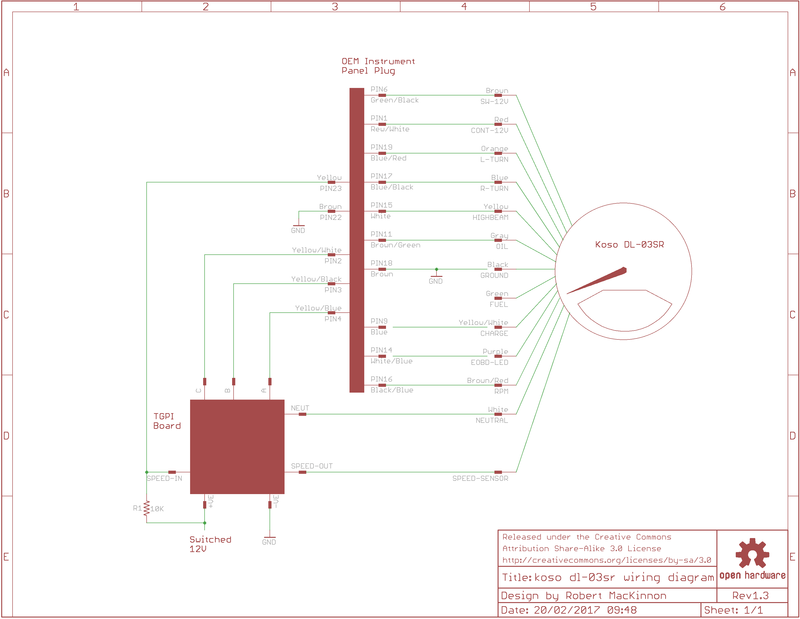 What you've found is the BEP 1.0 schematic and it will work for the purpose you mentioned - start enable, neutral out, gear indicator and tachometer. One problem is that the outputs of the CD4028B are active high and the gauge's gear inputs expect active low. You will have to put an open-collector NPN transistor on the output of each of S1 through S5. Use the same transistor configuration as is being used to drive neutral. That schematic has been photoshopped. If you want the full schematic, send me a PM. Thank you very much. I know about photoshop, I clean the function that I don't need. What transistor should I buy? And should I put a resistor befor transistor like neutral drive? Have a 1992 K100rs. Is the circuitry likely to be the same across the age range? Also, is pricing still current.? Yes, the wiring is mostly the same for this device across the range of models and years for the K-bike. And the pricing is still current, as listed in the first post. The board design has changed slightly with the latest version but it still offers the same functionality. Boards work well! Buy them and go for the most functionality. If you don't need it you can ignore it but if you find out you need something (neutral indicator) it's easier to have the board that supports it than find out you needed it later. Motoscope pro and M-Unit. It's a lot of work to do it right. I'm sorry if I missed anything, but has anyone been successful in using a Motogadget speedometer together with the OEM BMW speed sensor, by using any of the above mentioned methods/circuit boards? if i had a hat i would take it off to you guys brilliand is first thing to come to mind,before reading this post i thought i was smart just goes to show you how wrong one can be. By 3-wire digital tacho, do you mean your gauge has a +12V wire, ground wire and RPM sense wire ? It may be possible to hook up the sense wire to the coil primary and have it work without any signal conditioning. Some guys find that the tach needle bounces all over the place though. It would be better to build a conditioning circuit like the one I describe in my post called "Engine Speed Condition circuit that prevents RPM tachometer needle from bouncing".